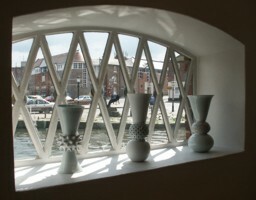 The work of the students and artists associated with the Quay Arts Centre has recently featured in an exhibition at the Quay Arts Centre's Rope Store gallery. 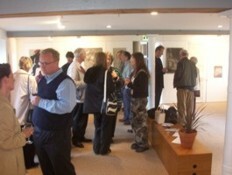 The exhibition included life drawing and porcelain work. It ran from 20th March to 17th April 2004. 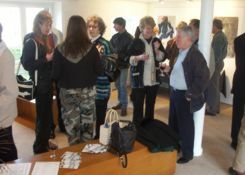 The following photographs are from the exhibition and its party, which was on Saturday 17th April 2004. 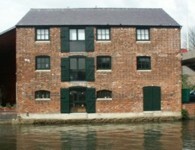 Cat's pots can be seen in the Rope Store window (left). Put your mouse over the picture for a close up! Cat submitted three pots for display and all were accepted. They are three of her favourite pots. As you can see, they are all similar in appearance and have applied textures and a very simple, yet beautiful, blue celadon glaze. The pots are 'composite' pots, which means that they are made of several thrown shapes which are joined together while the clay is still wet. 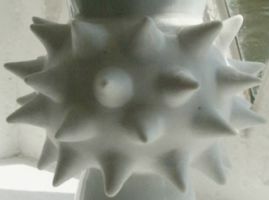 The pots also have applied decoration in the form of spikes, slip dots and texturing. Cat's spikey pots are very indiosyncratic and applied textures feature on most of her pottery. She likes her pots to have a manufactured finish - like they were made using some industrial process and not by hand. Sometimes, handmade crafts can be an excuse for shoddy workmanship. Cat likes regularility, uniformity and quirky industrialness to be the recurring themes of her pots. 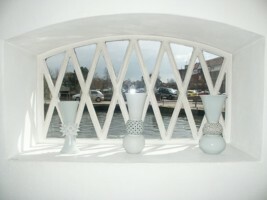 Cat's spikey pot was photographed and the picture accompanied a feature about the exhibition which appeared in the IW County Press (left). 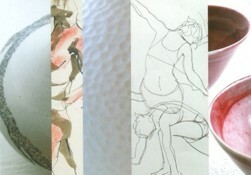 The hammered detail of Cat's slip dotted pot was chosen as one of the images for the exhibition publicity (above right).